Panoramic photo of what the little silk factories look like inside the residential homes. There is a 10 year old girl who works in this factory, but they hid the girl in the other room when we got there so we could not meet her or take any photos. The photo on the right shows the simple neighborhoods where these homes are in, which shows the complexity in finding the people in these situations. Sidlagatta was an interesting place and it had a very different feel to it than the other villages we went to. Many of the silk factories that are located here are inside small residential homes in neighborhoods that one would never suspect to find little factories. The factory owners were much more aware of our presence and very territorial over what they were doing there and who was working for them. The Jeevika team knew of a couple of children in these silk factories and they tried to be able to get us into these site to visit with them. We tried to meet Gayatri in one of these sites, but when we came close to the home, the owner was clued into what was happening and it was not safe for us or for Gayatri to be there. They told us that the owner was very upset and was going down to the floor too beat Gayatri and her mother because we were coming. 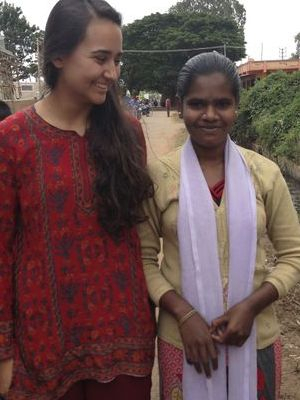 We instead parked at the end of a nearby neighborhood, and the Jeevika team was able to go and get Gayatri and her mother out of that situation. We did not understand how they were able to get permission from the factory owner to take Gayatri and her mother out to meet us, but we were grateful when we saw them on the back of the scooter with the Jeevika team coming down the street to see us. Gayatri is a beautiful 15 year old girl who has been working in this silk factory since she was 7 years old. She works for 10 hours a day, 7 days a week and has not been able to go to school at all. Her mother has been working there for 15 years as well, but due to her mother's failing health (she has diabetes and asthma) they put Gayatri in to work to pay off the debt of Rs.25k (approx $500 US). She is paid Rs.60 per day ($1.20 US), but they also charge a high interest so she does not have any hope of paying off this debt. 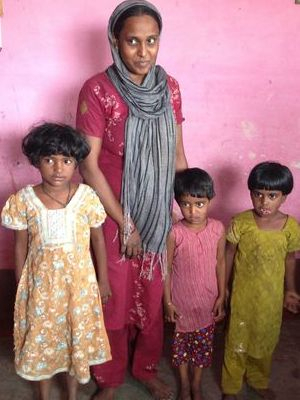 Gayatri's mother is 35 years old and started working in the factory since she was 20. She is paid Rs.100 per day ($2 US). Her husband is old and so he is not working. Gayatri, has also lost much of her short term memory. They do not know if it is because of the treatment by the factory owner or the poor working conditions with no ventilation in the room with the machinery and hot coals, but they have never been able to go to the doctor or hospital to help her with this issue. Gayatri believes that she will be here her whole life, but the Jeevika people are trying very hard to help her and get both her and her mother out of this situation. We visited another home in Sidlagatta where we were able to see inside. These are the photos on the top of this page. We could not do a formal interview as again we needed to be discrete and careful, but we were able to find out about the 10 year old girl who was working in the factory on the ground floor. Her mother was upstairs with her other two small children and brother's daughter. They were similarly put into this situation as a result of poverty and being indebted to the silk factory owner. Several members of their family work in this factory to pay off a debt, but we were unable to get the specific details on this case. We wanted to meet the 10 year old girl who was working in the factory, but they hid her in the back and we were never able to even see her. They just told us about her and that she has started working here about 3-4 months back.